My Two-Hour Wait for Green Chile. Worth It. On a vibrant corner in Santa Fe, New Mexico, with the sunbaked mountains looming in the background, there is an old restaurant called Café Pasqual’s. Its name honors the patron saint of cooks and shepherds. I had read about it in many articles, and was always intrigued when I would overhear locals refer to it as a landmark eatery. It was at the top of my “must try” list during a long weekend get-away last summer with my family. 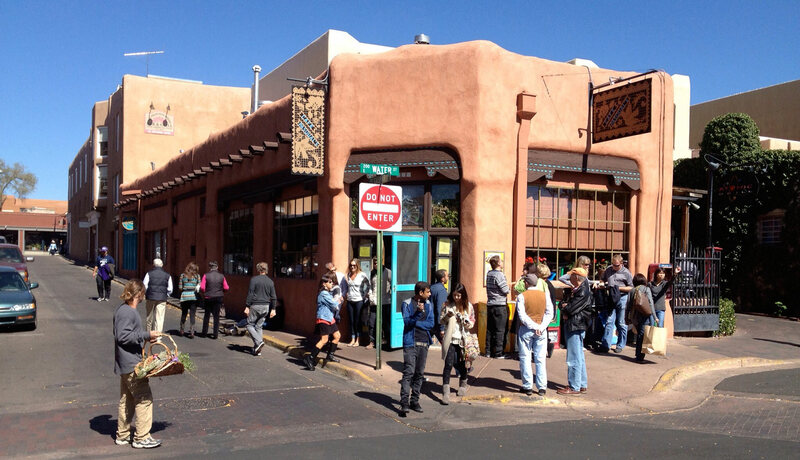 Santa Fe is a small, quaint town full of talented artists, wonderful markets, and a rapidly growing food scene. Late one morning after walking around the plaza in search of cool Native American jewelry, we were all ready for a hearty New Mexican breakfast. We headed to Café Pasqual’s. Upon arriving, I see people jammed inside the bright turquoise door and spilling out into the streets. Pasqual’s is a tiny place and it was packed, as I knew it would be. It was almost noon, everyone was hungry, and my appetite was definitely responding to the savory smells coming from the kitchen. We put our name on the list, picked a shady spot, and began the long wait. While I sat on the sidewalk I looked across the street and noticed world-class Chef José Andrés. He, too, was waiting patiently with his kids while watching Real Madrid vs. Barcelona on his cell phone. Seeing a famous chef like Andrés sitting on a street curb, waiting in line like everyone else, speaks volumes about Santa Fe’s lack of pretense. At Pasqual’s everyone is treated the same and if you want some of the best local food in town, then waiting in line is simply what you do. And, there is always a line. I have a lot of respect for Chef Andrés, and lovely memories of meals at his restaurants, so I knew if he was willing to wait like the rest of us, then our meal was going to be Oh. So. Good. “Dillon party of five!” After almost two hours we were finally seated. The menu is a long list of mouth-watering plates heavily focused on local and organic New Mexican cuisine. Written in both Spanish and English, the menu alone is an excellent start to the dining experience. Café Pasqual’s features a variety of indigenous ingredients and they do a wonderful job of explaining each dish. 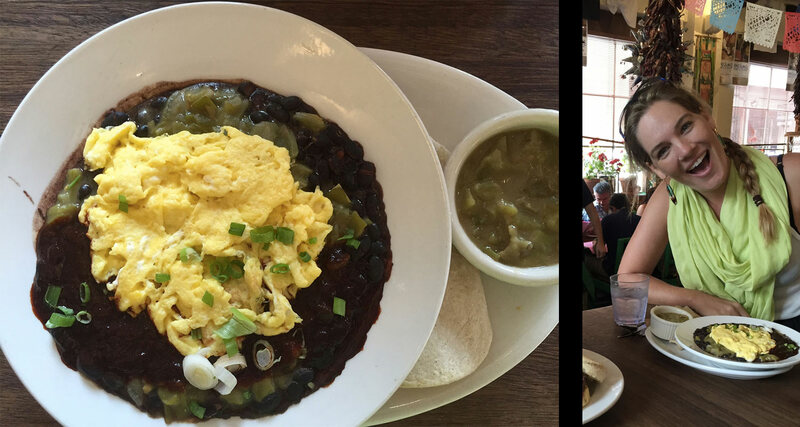 I decided on a local favorite of green chile, slow roasted pork, with black beans topped with scrambled eggs, more green chile, and green onions. It was no easy task choosing between this, their incredible green chile cheeseburger, or their signature huevos rancheros. The food arrived and, with the very first bite, every one of us freaked out. Our table was overflowing with zesty main-plate creations and what looked like endless sides of rice, beans, homemade tamales, tomatillo salsa, and made-from-scratch blue corn tortillas. It was a feast and, hands down, one of the most enjoyable meals I have ever had. The setting is casual, and the presentation is nothing fancy. Pasqual’s is all about the food. Period. I noticed Chef Andrés and his family were obviously enjoying it just as much as we were. We raised a glass to him, and exchanged a few words about how much we liked the food and the atmosphere. In our modern and crowded world, waiting has simply become a part of living. We wait in line at the supermarket, we sit in traffic jams, we wait in airports due to overbooked and delayed flights, and we wait to be seated at restaurants. But while traveling, when every hour of every day is precious, I always seek out the places and the experiences that are truly worth it. They may be hard to get to, they may be packed, it may take four airplanes to get there, but they are certainly places of authenticity. When I travel I want to learn something new, experience a place and community that I will remember and, perhaps most importantly, I want to have a story to tell about it. My travels are always a good reminder of Florblanca’s ultimate goal: to provide a unique and authentic experience. The world is full of beautiful beaches and luxury villas. But, not all destinations offer that great story that will follow the traveler home. Nestled here on Costa Rica’s Nicoya Peninsula we are spoiled with natural beauty. Everywhere you look is a picture-perfect photograph. At Florblanca, we take all of that then add the stories to it. Through our staff, through our food, through our daily excursions and more, we delight in building, layer upon layer, the most extraordinary experiences for all our guests. We know that Santa Teresa is hard to get to, and yes, it may take four different airplanes, but we believe that the journey is part of the charm. After traveling hours to get here, my wish is that every minute of every day becomes a valuable part of a rich and personal Costa Rica story. A life well lived is about stories. It’s about a mouth-watering bowl of green chile in Santa Fe. It’s about the place, the way it felt, the way it looked, and of course the way it tasted. And it’s about waiting in a long line with José Andrés for a simple and delicious meal. Florblanca has stories. There are stories about the moment the evening sun slips into the Pacific, leaving behind a legacy of color that will burn for a lifetime. Or, stories about the jungle and the morning sounds of dazzling tropical birds, or the distant roar of howler monkeys. There are stories about the smiling faces of people who live and work in a magical place. And there are wonderful stories about a lonely stretch of beach that connects a lovely destination, called Florblanca, to the beautiful blue Pacific. Life is about stories. At Café Pasqual’s it was about the wait. At Florblanca, it’s about the journey.